Our daughter was 11 when we unenrolled her from public school. For the first 11 years of her life, I worked full-time-plus, in an office, and for several of those years, I was also a full-time college student. My husband works a 55-hour-a-week office job as well (much of that in the late evening and early morning hours), and there were days we felt like we didn’t even see our house, or each other. 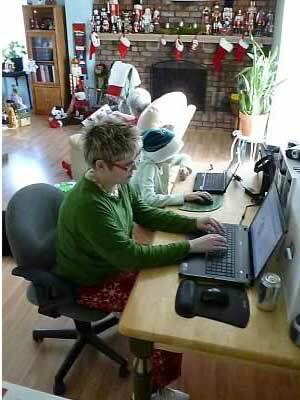 Mother-daughter computer time (on Christmas). Sarah got her own new computer as a gift, and I had a big project due! So, uh, homeschool? And homeschool in a way that required our involvement, not just as “cyberschooling facilitators” but as fully engaged parents? It surprises some people that we said, “Uh, YEAH.” (Probably not you, if you’re reading Christian Unschooling, though!) What might surprise you is that our master plan didn’t involve any fewer work hours. I still work full-time-plus – but only 4 to 5 hours a week of it are anywhere but at my own home computer desk. My husband still works in an office full-time – but his hours no longer cause him to go days without seeing Sarah. In our family, we made the choice to keep two incomes for a few reasons. First, we have a big family goal, to pay off all our consumer debt, and the money we’re putting toward that means we’re only a few years from debt freedom. We didn’t want to set that back. We also believe in sharing our talents. The things we do, we do because we’re blessed in certain areas and want to be a blessing to others. So the “work” was going to stay, but the situation around it would have to change. Finally, we like doing neat stuff. We try to be economical, but that awesome visit to the wolf sanctuary in our town? Yeah, $40. So we like having the financial freedom for “unschool extras” as much as possible! I once joked that we unschooled because we couldn’t afford not to, and while we were kidding, we certainly wouldn’t be springing for Boxed Curriculum That Shall Remain Nameless even if we for some reason wanted to! So how do we fund this cool life of ours? The most popular post of all time on our family’s blog is this ultimate guide to homeschooling as a working mom, so I’m guessing it’s pretty safe to say lots of people are trying to do the same thing. Specifically to unschooling, though, it’s been really interesting to adapt my work not just around Sarah, but to include her. My biggest gig is as a writer and manager for a major personal-finance blog. With Sarah’s permission, I turn happenings in our life (and conversations we have together) into posts like this one and this one. I get that not everyone has this flexibility. In our case, we put in a lot of years and a lot of hours to get it, and we make some kind of icky sacrifices at times in return. (Editing blog posts on Christmas, anyone?) Much as with unschooling, it’s been a work in progress. Sometimes things get too rigid – and I have to say no to freelance projects or extra hours, even though the money would be nice, because I can’t miss dinner again. Sometimes I get a little too laid back. I push work off until it’s close to a deadline, or I don’t pitch any side clients until the bank accounts looks dry. Yeah, that’s like unschooling too – those “droughts” where you feel like nothing’s going on. But it always comes together, and we find balance somewhere in those extremes. In our case, I think of my work as not something that takes me away from Sarah (in fact, I’m with her – and engaged with her – more than ever). Instead, it’s our way of looking at apprenticeship, and at how there are things that we’re good at that can help other people. And that’s a pretty cool thing to “strew” in unschooling!